The controller is available in one of two configurations: an in-line model which allows for direct installation of the probe and chemical injection fittings into existing piping (BL121-10) or a panel mounted system with a bypass flow cell (BL121-20). The bypass flow cell allows for calibration and maintenance of the probe without having to stop the recirculation pump. The HI1036-1802 is a digital probe that measures pH, ORP, and temperature. This probe also incorporates a potential matching pin. The pin is considered the “earth ground” connection and is used to prevent ground loop effects from causing erratic readings and damage to the system. The BL121 is equipped with two peristaltic dosing pumps with replaceable chemical resistant tubing. When using a diaphragm pump, chlorine gas formed from outgassing can collect in the pump head resulting in the pump losing its prime; the buildup of chlorine gas is not a problem with peristaltic pumps that use rollers and tubing. 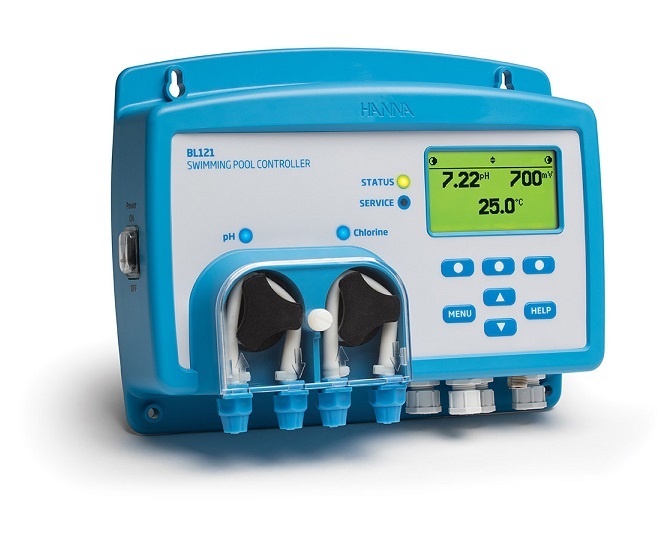 The BL121 features proportionally controlled dosing pumps. 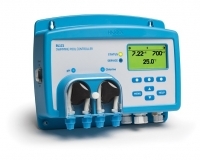 Based on the sensitivity of the process to chemical addition, these controllers allow the user to adjust a proportional band. This setting determines the amount of time that the pumps are dosing as a percentage of the deviation from the set point allowing for very fine control in maintaining the desired set point. The flow rate from the dosing pumps is adjustable from 0.5 to 3.5L/h. Larger bodies of water require more chemical to be dosed than small bodies since it takes more chemical to realize a change in the reading. The adjustable flow rate, like the proportional band, allows for better control in maintaining a desired set point. With chlorine disinfection there is an inverse relationship between pH and ORP. As the pH level increases, the ORP level decreases. The BL121 utilizes a dosing consent feature that will not dose chlorine until the pH value is first corrected since it is possible to have a low ORP value even though there is sufficient chlorine. The dosing consent feature prevents wastage of chemicals and avoids a higher than necessary chlorine concentration. An inline flow switch or a mechanical relay connected to the recirculation pump power source may be connected to the hold input of the BL121. With no flow or when no power is applied to the recirculation pump, the hold circuit disables the dosing pumps. This will prevent any dosing of chemical when there is no movement of water in the system. The versatile display of the BL121 allows for three screen modes. The LCD can display all three parameters at one time, a 3-second cycle of single parameters, or a real-time plot screen with options for parameter selection, zooming, and log recall. Hanna controllers allow users to enable or disable the low and high level of alarms for all parameters. When an alarm is activated, all dosing will stop. The alarm system also offers overdosing protection if the value is not corrected within a specified time interval then the meter will go into alarm status. The BL121 offers multiple LED indicators for status, servicing, and pump operation. The STATUS LED changes color based on operational state; green when setting are in range, yellow when user intervention is required, and red for problems. The SERVICE LED indicates any alarms and process errors experienced by the controller. The readings for each parameter are automatically logged every 10 seconds. A new log is started each time the instrument is calibrated or at the start of a new day. Logged data include pH, ORP, and temperature values, last calibration data, setup configuration, and any event data. Each log is saved as a .csv file for easy transfer. The BL121 offers three 4-20 mA outputs for pH, ORP, and temperature. Each output may be disabled or connected to an external recording device and is adjustable to be proportional to the measured value. For greater flexibility and better resolution, the analog output can be scaled; users can define any two points within a parameter range to correspond to the analog output span. This adjustment allows better resolution in the range of interest. For review and storage the users can easily transfer data to a PC using a flash drive and the USB port. Hanna’s BL121 controller features a password protection solution that offers restricted access to calibration, setup, and review of logged data. The password can be set and enabled/disabled during general setup of the instrument.